One of the locations where i made an art action during the DakArt Biennial was the Centre Culturel Blaise Senghor in Dakar, Senegal. 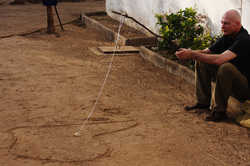 With a stick I drew the contours of Africa in the sand. I attached a line to the stick and a hook to the line and a piece of bread to the hook. Then I sat down motionless for half an hour.